A photo-blog for those who love history. A blog that makes its way throughout the Federal Republic of Germany, starting in the environs of Stuttgart, in the southern state of Baden-Württemberg. This photographer-writer takes his readers on a photographic journey as he discovers new places to photograph. Follow along as he visits Germany's known and lesser-known places and takes excursions across its borders. When I first started this blog some years ago, I began by committing to my own photos, stories and historical explanations of places located exclusively in Germany, beginning with Stuttgart, where I was living at the time. Well, although there are still hundreds of more possibilities within the state of Baden-Württemberg alone about which much can be written and photographed, I have decided that it is time to throw in a couple of locations not only outside of this state, but the Federal Republic altogether. So, I am starting this out by presenting a place I had always wanted to visit when I was a kid. A place that not only has its own princely family, but also a real castle in which they live. A postage-stamp sized place that can be seen all in one day if you really want to cram everything in - not advised. Is it Monaco, home to the late Princess Grace, or perhaps the co-principality of Andorra? (Did you even know Andorra had "co-princes"?) Nope, it's bigger than Monaco, Vatican City, and the most ancient Republic of San Marino combined, but smaller than Andorra. Ladies and gentlemen and other assorted readers, let's have a look at Liechtenstein, a sovereign nation so small yet rises rather suddenly a whopping 2599 meters (8526 ft.) from her river-valley capital below to Malbun, its only ski slope high above; a country clinging to the side of a small section of a central alpine mountain range nestled smack between Switzerland and Austria such that you could miss it altogether when driving by if not paying close attention. A land that becomes even more lovely the higher you climb. I can't honestly tell you what got me interested in this little place, but the fact that it is so small and is famous for its postage stamps (yeah, I collect them) along with having that prince probably had something to do with it. Oh, and as mentioned above, it's location in the central Alps of Europe didn't hurt either. I had always been interested in faraway places, but at the same time I also had a penchant for places that were not particularly on the main tourist routes. Some people have been known to look at me like I have two heads when learning of some of the less-traveled places I have wanted to see. Yes, of course tourists do stop by Liechtenstein, but they probably don't go much further than the capital of Vaduz itself, and that just so they can say they've been there. However, I can go a couple of steps further by saying that I know a few lovely native Liechtensteiners who still live there, have had other Swiss friends from just across the border who worked in the principality, and I've been from the Rhine Valley at the bottom of the country to the very highest village of Malbun at the top and a couple of other villages in between without the tour groups. And, interestingly, there is actually much to see there, especially if you enjoy hiking and marvelous views of the Alps. Now because I love to eat, I am just going to jump into describing one of the national dishes of Liechtenstein (I'm going to get tired of typing this country's name) and it is called Käsknöpfle, which is basically a Spätzle dish mixed with onions and cheese (a blend of Swiss Gruyère and Emmentaler, I think) with a side of applesauce. It is wonderful. I was served it up in the town of Triesenberg, high above Vaduz along with venison, I believe, and it was to die for. Venison does not necessarily accompany the Käsknöpfle, but this plate did and I enjoyed every bit of it. The view from the restaurant was simply breathtaking, looking across the Rhine Valley directly at the Alps due west on the Swiss side of the border. The valley itself was completely socked in by fog (see main photo in this official Liechtenstein website to get an idea of what I am talking about), but up in Triesenberg, above the clouds and fog, the view was sunny and absolutely exquisite. In my photo above, you can see a brilliantly clear view of Liechtenstein. Of course photographs never seem to show the borders that we see on maps (go figure), so let me explain. I took this photo from the Swiss side of the Rhine River from the castle of Sarganz, neither of which you can see or make out in this photo. It is the river that creates the natural border between the principality and its Swiss neighbor. The mountains create the border with Austria to the East. If you look carefully in the very middle of the photo, you will see a very small, dark hill on which sits a white structure with a little tower. This is Schloss Gutenberg, located in the southern Liechtenstein town of Balzers. The castle is one of five in the country and has enjoyed a long history. It was once owned by the Habsburgs, former rulers of Austria-Hungary but originally from Switzerland. Today, the castle is a municipal museum. But back to "seeing" the country in the photo, Liechtenstein is up against those high mountains in the background and makes its way toward the left (north) in the photo and includes the mountains up against which the country sits. The other side mostly belongs to Austria. Perhaps you can make out houses on the mountainside in the far-left background of the photo? They belong to Liechtenstein. Everything in the green foreground is in the Swiss Confederation. Okay, Schloss Gutenberg was in and out of private hands for centuries. I believe the last private owner had rights to live there until 2001. Check it out when you get there if you're interested. A lot of restoration has taken place there in the fortress over the past 100 years and some of the buildings around the castle itself were added during this time. But fear not, this place has basically been here in one form or another for over 700 years. So yes, it's old. Balzers itself is a lovely town with its own nice church, which is not particularly ancient, as well as some attractive streets and neat houses that make for a nice residential community. A bus service runs between Balzers and the capital, just north of there, which is a good jog away (I mean that literally), and also connects the country via one of the several Rhine bridges into the canton of St.Gallen, Switzerland, more specifically the city of Sarganz, where Swiss rail service gets you easily to just about anywhere you may want to go from there. No trains cross into Liechtenstein, and no, there is certainly no airport either. Car, bus, foot, or bicycle are just about the only ways to get there. Oh, and be aware that as you look around and upward (or if you are high up in the country and looking downward), not all you are probably seeing in your line of vision is actually Liechtenstein. Remember, the country really is very small, so it is difficult to get but so many vantage points from which you will be able to see just the principality itself within your sight range. Either Switzerland or Austria or both are often in view as well. After all, Liechtenstein only, but proudly, boasts a whopping 160 sq. km. (62 sq. mi.) of territory. Some readers here may find it curious that there are no passport controls to get into the Principality of Liechtenstein. The country does not even have an official passport stamp anymore. I don't know further details on that, but since 1924 it has been protected by Switzerland, has used the Swiss franc, and doesn't even have to send conscripts into the Swiss army. Lucky them. However, for those wishing to get a passport-like stamp in their passports to record having been there, a "stamp" bearing "Fürstentum Liechtenstein" (Principality of Liechtenstein) with the princely hat can be purchased for the staggering cost of 2 Swiss francs at the tourist information center in the middle of Vaduz. You can see one of my stamp entries below, above the stamp for Andorra. 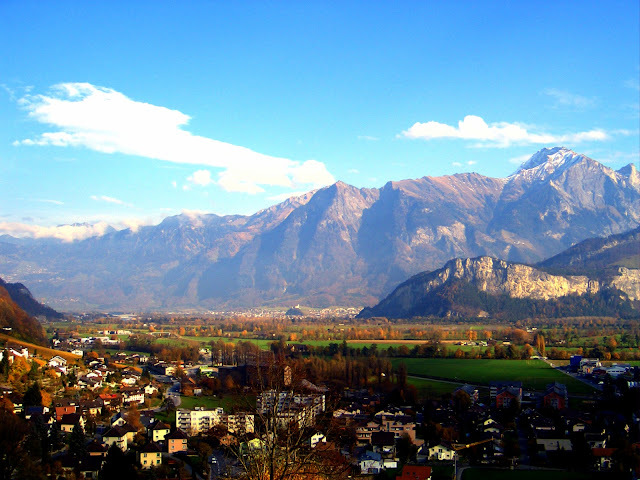 Let's talk a little, and I mean little, about Vaduz. One usually imagines that the capital of a country would either be the biggest city or at least pretty big in any case, right? Well, Vaduz is the biggest, um, "city" in the country, but it really isn't something most people from outside the country (and I dare say many within) would actually call a city. I mean, it's little. Like, really little. So for me, it would constitute more of a big town. Now, I don't mean any disrespect at all, but I'm just calling it as I see it. The princely family, headed by H.S.H. Prince Hans-Adam of Liechtenstein, resides in the castle that sits directly above Vaduz itself. It almost hangs right on the edge of the city, keeping an eye on what's going on below. Construction was begun in the 12th century, so it isn't exactly modern architecture. Certainly renovations have taken place over the centuries, and it is no longer used as a fortress to protect the country, but having been up to the main door myself, I can tell you that it still isn't exactly easy to break into. The House of Liechtenstein is one of the oldest noble houses in Europe. It has considerable historical holdings in Austria, from which they originally come. Over the centuries during which they have had power or regional influence, they have done well in expanding their wealth in art and real estate, and of course more. Following the fall of the Austro-Hungarian Empire in 1918 and later at the end of World War II, palatial properties they owned in the former Czechoslovakia were confiscated by the state, never to be returned to the family until this day. Yet, the extended Liechtenstein family, with about 100 members, still owns beautiful estates and art collections in Austria, many of which are open to the public. That said, interestingly they receive no income from the country/government of Liechtenstein in their role as head of state. They are funded by their own extensive family holdings. Therefore, no citizen of the country can exactly complain that the monarchy is costing the citizens too much to keep up. Besides, there isn't much pomp and circumstance there to add to costs. So, to sum up, the castle there above the town is the only residence the princely family uses as such in the country. There is a small and unremarkable pedestrian zone in Vaduz. The national museum there is modern and nice, but most of the prince's vast private artwork is, I believe, mostly in his Austrian palaces in Vienna, but don't quote me on that. I would like to note here that to shrug off this historical family as just another rich, money grabbing noble house who are controlling oppressors of the common man would be most shortsighted. Having read histories of this ancient family, I have uncovered numerous sources of princely members donating altogether vast sums to charity and to the education of their subjects. Charities are still important interests of the family today, as is reported in public reports of their financial doings. By the way, I have no photo of my own of the princely family to share on this blog page for you to see. And for good reason: Every time I said, "Cheese! ", one or all of them would make a funny face, so I gave up trying. You can find a more suitable photograph of the princely family here. The old Landtag, or parliament building, is small, traditional looking and attractive, but in recent years, a new and interesting addition has been built next to it for the workings of the government. You can see more about the Landtag here. In some ways, although Liechtenstein is a democratic and free country, the involvement of the reigning prince in government and external affairs can be quite strong. Sometimes I think of the principality as a modern quasi-fiefdom. It's almost like the country actually belongs to the prince as it did in the past, and he does in fact own some parts of it in addition to the castle. But since there has been no revolution to depose the monarchy, and the people have a fairly high standard of living and can come and go as they like, I rather think they are okay with it, so who am I to say? located on the pedestrian zone leading into the middle of Vaduz. The prince's castle is perched above. One of my friends in Liechtenstein comes from a distinguished family who owns a prominent home in the capital. I am not going to mention a name or location as they really are a private and lovely lot. When invited to their home for a spontaneous tour after dinner out up in Triesenberg one evening, I was pleasantly stunned when shown an extensive private art collection that lined seemingly every single wall and space throughout the residence. I had no idea my friend's family was so invested into art. And the history of the house itself and other contents didn't so much impress me in a sense of grandeur (as grand as the place indeed was! ), yet I felt a clear sense of being in a living house, a home, not a museum. The artwork, beautiful furniture and even some of the threadbare showing on the edges of a few carpets demonstrated that the family was somehow as just a part of that house as the house was a part of them. Perhaps rather odd sounding, I confess, but I left that large, elegant and historical home with a cozy feeling rather than one of being overwhelmed by wealth. My friend's graciousness and modesty blended in to help really appreciate her and her family that much more. I dare say they are just one of a number of other such private families in the little country who enjoy and appreciate being able to live there quietly. But Liechtenstein is not exactly a backwater. Small as it may be, it’s international reputation in banking, which has had its shady side over the years, and simply being a curious place have kept it from being unknown. Furthermore, the country does not only have native-born Liechtensteiners living and working there. Instead, in a population of just under 40,000 people (2016 statistics), nearly one-third of the residents are foreign nationals and by all means a large part of those residents are made up of non-Swiss or Austrian citizens. This indeed says something about their diversity. The princely family itself has also married well outside of its little borders, ranging from Germany to Panama, so diversity certainly sits around their dinner table too. No country is perfect in handling ethnic diversity and acceptance, and Liechtenstein is no exception in facing the potential challenges, positive and negative, which this can produce. But let's get back into nature and head on back up toward Triesenberg and Steg, high above Schloss Vaduz. One of my favorite things to do when I get to visit Liechtenstein is to take a drive up to the tunnel through which one must travel to get all the way up to Malbun, at the top of the country. However, just west of the tunnel's entrance is the town of Steg. Now Steg is a popular area for sport and has a chapel located there which is often found in images commonly seen in national tourist brochures. Across the road from this little white chapel is a small café/restaurant called Bergstübli where you can sit outside and just look - at nothing and everything. It is so out-of-the-way in the greater European scheme of things, that just being there, outside, having your coffee on a summer day, looking out across the road at the stream and chapel and alpine landscape in general can be heaven when you need peace and quiet. Further back down the road from Steg, heading back through the tunnel toward the town of Triesenberg you pass more bucolic settings with what appear to Maiensässen in the fields. Now what on Mother Earth is a Maiensäss you ask? Good question. You can always google it - that is if your German is good - or just allow me to explain it like this, in my own rustic attempt: A wooden mountain structure that is used for cows and anything associated with spring/summer grazing. Apparently these small, scenic alpine buildings were originally used starting in May (Mai) in the higher grassy regions in this part of the alps, and säss is local language for "seat", hence, where the cows are situated for the grazing months, perhaps beginning in May? In any case, they are often photographed or painted in alpine landscapes and easily associated with Switzerland, Austria, or in this case, Liechtenstein. You can just park your car and walk along the paths found everywhere and enjoy the wonderful views. Everywhere you look, there are mountains and forests up here. Hiking is big in Liechtenstein; heck, just being out in nature is big, and rightly so. It seems to call for you. Yodelling anyone? There are other parts in the northern part of the country where I have never visited. If you divide a map of the country almost right in half horizontally, it would seem that I have covered the bottom half pretty well, but the northern parts which include Schaan, Planken and Ruggell have yet to be explored by me. I have a friend who lives in Switzerland, due north of the country, right on the border with Austria. Maybe I need to give her a shout and make a detour that direction and then pop down into the northern part of the principality to discover what exactly is there to be discovered. I do know that the prince grows his own wines just north of Vaduz and also in Wilfersdorf, Austria. These make up the Hofkellerei des Fürsten von Liechtenstein (Court wine cellars of the Prince of Liechtenstein). They and other princely estates are worth checking out, especially if you appreciate splendid, historical architecture in addition to possessing a palate for wine tasting. There is a tasting room directly in Vaduz. 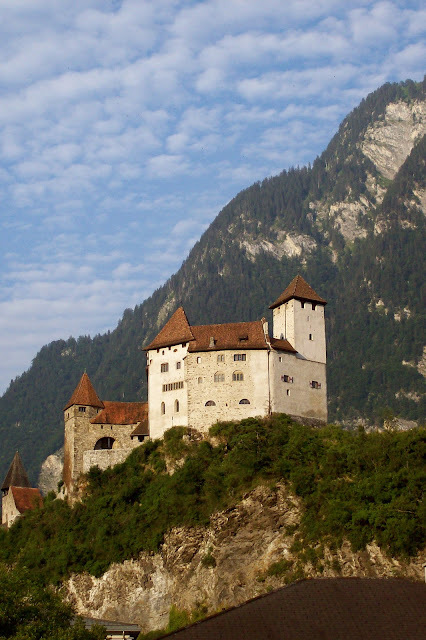 Yes, Liechtenstein is a country with a few surprises which can be found within its small borders. From the medieval princely castle all the way up to the tree-trunk carved water troughs. If you’re in the area, that is Europe in general, be brave; take a detour and discover the place for yourself. And for heaven's sake try the käsknöpfle! © Copyright 2012: Photographs in this blog may not be copied or downloaded without permission. Awesome Inc. theme. Powered by Blogger.